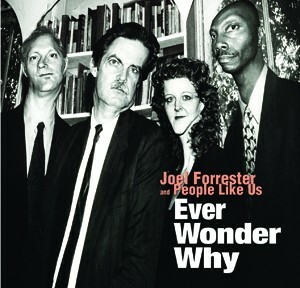 Joel Forrester has had a fascinating career. He studied piano with Thelonious Monk, scored early Andy Warhol films, wrote the theme for the popular NPR show Fresh Air , accompanied silent films at the Louvre, and spent years as a principal member of the fondly remembered Microscopic Septet..
He’s also been the driving force between one of the liveliest bands in town, People Like Us, a quartet devoted to Forrester’s quirkily intelligent compositions. Ever Wonder Why collects eleven new and not-so-new Forrester tunes, a typically eclectic assortment that highlights his winning mix of erudition and humor. For those familiar with Forrester, it’s no surprise to find a novelty like “Bebop Cowpoke” alongside dedications to Mary Lou Williams and overlooked hard bop alto saxophonist Frank Strozier, as well as an earnest vocal choir reflecting on Sept. 11th. As a pianist, Forrester is heavily influenced by Monk, along with Monk’s stride and boogie-woogie predecessors. His primary foil is the marvelous baritone saxophonist Claire Daly, who shares his absurdist sensibility as well as his deep knowledge of the jazz vernacular. The fine rhythm section includes Dave Hofstra on bass and Ronnie Williams on drums, filling the chair held by the late, great Denis Charles. This is serious music played by serious musicians who don’t take themselves too seriously.